ESTES PARK, Colo. – This town of about 6,000 people is home to around 4 million summertime visitors who take in the exceptional hospitality and beautiful landscape that is Rocky Mountain National Park. 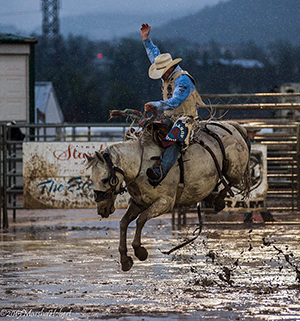 It’s about to get a little bigger with the 90th edition of the Rooftop Rodeo, set for 7:30 p.m. Wednesday, July 6-Monday, July 11, at Granny May Arena in Estes Park. Nearly 800 contestants have signed up to compete during this year’s event. The 2015 Rooftop Rodeo featured a then-record 724 entries, so the increase means good things for the community and for the rodeo in general. The prospective contestant list will feature more than 90 athletes that have all qualified for the National Finals Rodeo, the sport’s year-end championship that takes place each December in Las Vegas. Among those are 15 world championships that dozens gold buckles combined, like four-time barrel racing titlist Sherry Cervi of Marana, Ariz. Not only does she own 18 NFR qualifications, but also she has earned more than $3 million in her career. “It’s great for us to see so many of rodeo’s best who want to be in Estes Park for our rodeo,” Vigil said. “We want to provide them with the best hospitality possible and let them know we are here for them. That’s why Rooftop Rodeo has been recognized as one of the top 20 events in ProRodeo. It has been named Small Rodeo of the Year five times; since 2011, it has been listed among the top five medium rodeos in the country. A key reason for that involves a tireless work ethic among members of the community that donate their time for the event. It takes hundreds of man-hours every year to make the week of festivities as successful as they have been over the years. “We are very proud of the history of our rodeo,” Purdy said. “This is our 90th year, and to have a record number of contestants enter our rodeo is just going to add to our celebration.